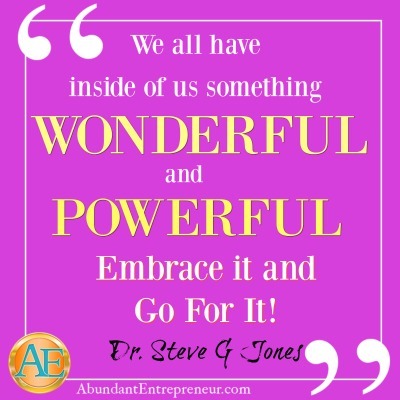 “Whatever you do… whatever your passion is… whatever you feel good about… whatever your contribution is… embrace that!” – It’s no wonder that I’m always so delighted to talk to Dr. Steve G. Jones. And this time is no exception. Steve is a renowned hypnotherapist and the author of many, many books – but I think what excites me the most when I sit down with my friend, is the opportunity to bring his tremendous wit and insight to you on the topic of how simple it is to make money online. People say that the easiest way to succeed is to copy someone that has already done what you are wanting to do and Steve is definitely one of the stars in this area. I can’t wait for you to hear his story. After WATCHING the interview, read my ‘notes’ below the video and then scroll to the bottom of the page to leave a comment.Or, to just READ the highlights, click the link at the bottom of the page. Does that leave you feeling EMPOWERED? It should. Really think about that. Everything you need, you’ve already got inside you. Just embrace it and share it! That’s really the secret to succeeding in any business – online, brick-and-mortar, start-up or established. It all comes down to what you have to offer and figuring out how to share that with the world in the most effective way possible. What did you do for fun this week? What got you excited? What did you feel a tingle of anticipation about when you thought about getting to do it? Or, what did you excel at? What is that one thing that you do so easily that seems to stump other people — and you don’t understand why they are making it so much harder than it has to be? There is a genius in you. A talent, or ability, or knowledge that is so familiar to you – that you do so easily, you may not even think about it as an ability. It just seems normal. So, take a few moments over the next few days noticing the things that come easily to you. The things that other people might ask you to help them with. These “hidden treasures” are really important for you to recognize. Because if you’re not already incorporating them into a business or revenue-driving opportunity, it’s the perfect time to start! Was there something in the interview with Steve that really touched you or inspired you? Don’t be afraid to share! Scroll to the bottom of this page and leave a comment. It not only helps me know what you like (and what to bring you more of) but your words might be the exact thing that someone else needs to hear. You are a unique and integral part of this community so THANK YOU for reading, watching and joining the conversation at whatever level you choose to participate with us! Looking to read highlights of the interview? Click here. Very inspiring video! Needed that reminder! Thank you Sabrina and Dr. Steve G. Jones! Thanks, Diana. So glad to hear it was appreciated! Informal and engaging conversation around ideas that were new to me. Will be watching a second time around. Very encouraging to anyone who is thinking of becoming an entrepeneur. In fact, it plants the possibility of taking what you love to do and making it work as a business. Glitches along the way–yes–appreciated the example Sabrina gave of the male dancer earning his “dancing shoes”. (Liked the illustration of the deer attachment) Adjustments always have to be made to progress to the next phase. May feel uncomfortable at first, but determination and practice raises confidence and is the path to success. Informative and fun interview. Yes, EXACTLY Ellen! That’s what I was hoping would come through. So many people can relate to that, Janice. It seems like the easiest thing in the world would be to figure out what you love but so many people have a disconnect with that – perhaps because we’re not really taught to listen to our own inner voices that way. But ironically, it seems so easy to listen to the judging voices — which are usually just other people’s voices and opinions that we’ve learned over the years. People that now we are just letting live rent-free in our heads. I enjoyed the interview with Steve Jones. His point appears to foster the idea of taking an existing regional brand and expanding it exponentially to a global brand. His products then moved from discs, speeches and books to on-line sales. Presumably, but not mentioned, is a subscription model as well. This is a path often taken by many authors, service providers, retailers and manufacturers. The reference to passion and Reality TV are somewhat sketchy in terms of how one would be able to build a global brand from scratch. One would expect that this would be a more daunting effort. I loved that too, Julie! The movie and the insight. Great video! Thank you Sabrina. You rock! thank you steve for sharing those ideas with me. my name is Jermain n i live in Malaysia. at 56 years of age, i m just discovring that teaching n talking n encouraging peolple is what i do best. i was working in a bank as an IT professional purely for the money iy paid me n i really enjoyed the job because of the money. i felt respected by society ,i cud buy anything i desired etc.but after i retired due to illness , i had no idea what i wanted to do, becoming a dedicated housewife made me happy for a while but when my husband walked out on me n my children. i was devastated. it was then i discovered that teaching is what i enjoyed coz it comes naturally to me n to inspire my students, that gives me a real high. i get paid dollars for hours but i dont mind coz i have more bonding time with my children. but i hv decided to teach in a professional way by joining a private school. in the meantime i hv joined a company thats putting education in the APP biznes n they doing network marketing. i bought the virtual franchise n now i find myself trying to meet deadlines n other people seem to be doing so well financially but i m not. wat am i doing wrong coz i m so stressed now.? Thank you for sharing, Jermain. First, congratulations on finding your unique talent! Second, BREATHE. Do what is in front of you. If you have more than one option, listen to your inner voice about what feels the most right for you. And trust that. And if your real joy is in working for other people, there is nothing wrong with that. But how about trying, for a few minutes a day, to create something for yourself. With all of your life experience to choose from, I’m sure there is much you could draw on and share with people. Find some topic or niche and just spend a few minutes each day, writing a book, or shooting a YouTube video. The more you try, the more you’ll know what seems right. But in having found what you love, congratulations! That’s a huge first step! Awesome, Nava! Anything that helps us to empower our daily life is crucial!! Very inspiring yet hard to apply especially when you are feeling yourself stressed and depressed . I have been working directly with people helping them trying to make them able to overcome their problems .all of a sudden life started to become so hard on mine to a level i unable to apply what i advise others , so many financial problems and more and more ……….. Wonderful, Cliff! Welcome to the community! Hi Marion, Thanks for the feedback. The site looks OK on all our test computers (including IE) but I’ll ask some friends for some advice and see what they say. And thanks for the kind words! Thank you so much, Elmer! It’s so rewarding to know that it’s appreciated! Fantastic to hear! Thank you! Hello, Neat post. There is certainly a concern along with your site in web explorer, may check this? IE still is the marketplace chief and a huge component to others will miss your fantastic writing as a consequence of this problem. Thanks for letting me know. I can’t see problem on our test machines here. Can you tell me what version of IE you are using? Or the type of device that is giving you problems? (desktop,laptop,phone, etc.) I’d really like to address the problem but unless I can duplicate it, it’s hard to know what’s going on. Thanks! This blog was… how will you say it? Relevant!! Finally We have found something which helped me. As Richard Branson reminds us, failure is a big part of life’s journey. Yes, there will be surprises and unexpected turns you’re not prepared for. It may be one epic failure or a series of mistakes, like Edison’s 10,000 unsuccessful attempts before the light bulb. Cheers! Precisely where are your contact information though? Very good video and nice to virtually meet you Sabrina, great interview with Steve by the way. I follow Steve and his work, and his products are very good. I wish he would talk more about the business back end stuff to do with success. I have been looking into the whole Internet marketing thing and it is huge, vast and mind-blowing. For one person with no budget, I am struggling even though I know my passion and want to help others. There are plenty of gurus who will sell you courses on this or that way to do it but right now I wish I had a virtual marketer who could work with me to sort it all out, or clone myself 4 times over so I could do everything myself. The mindset stuff is one piece but the marketing and business sides are a whole different ball game to a one woman band with no real budget, just passion. Any tips? I enjoyed this topic very much,thank you. Sabrina, thank you for what you do, sharing your gifts!! I discovered you in the middle of last night while watching a video from my main man, Carl Harvey. Fantastic content! Looking forward to growing in the community. I really enjoy how you weave humor into your interviews. I have put out my intention to start an online business this year, and say “bye bye 9-5” once and for all, then truly live MY life on MY terms. I am a huge follower of Laws of Attracton and am right this hot minute, creating my brand that blossomed and evolved when a community came together, organically, because I kept doing FB LIVE even when we found out my sweet husband was sick with cancer. I know now, that people were following hope, Pietro passed on in Nov of 2016, but my Daily DoseA DonnA is not about sadness or despair, but rather, deliberately reaching for JOY. This week, I am officially launching my YouTube channel. (YAY!) Thank you for sharing this, as I am turning this into a revenue producing business and am still figuring out exactly what that means! I look forward to more interviews Sabrina!! (Current website is not up yet, but comping soon!) and I totally loved the bantering at the end of the interview! Thanks, Donna! For your kind words and for choosing to be a light in a time of adversity! Hi Sabrina, really enjoyed your interview with Steve. I am actually acquainted with Steve;s work as i have purchased a number of his hypnosis tapes. I thoroughly enjoy them. I haven.t used all that i purchased but the ones i have listened to have been inspiring. I have his Wealth one and his abundance, plus a number of others. Yes, Steve’s great isn’t he? Great heart and he really knows his stuff! Thanks for reaching out! I loved the reference to the line from “Tinman”. I’ve always taken the same meaning from it that the good Doctor mentioned. The cool part is that in his context it personalized it for me. Like you said, I have it in me. I just need to accept its existence & embrace it. Thank you for making that connection for me!! I loved that line too!! 🙂 It’s a great reminder! So strange, I signed up for SSA through an intuition and I’m getting stuff from Natalie ledwell and I don’t know what it is the Mind Movies don’t even work on my computer, I listen to the thing and I start from being a cynic and things are proven to me, but so far, things seem easier because I listen to their subliminal series, but life has gotten so interesting I’m also using tons of tools at the same time. But I seem attracted to you and what you’re doing. Thank you for doing what you’re doing. Wonderful video and notes! I have just made the decision (last week) that I really need to take my coaching business online yet the idea of actually doing it felt very overwhelming. There was something very reassuring in what you and Steve talked about today that seemed to take the fear out of doing it. I loved what you both agreed on was key … RAW. Like you, Sabrina, I’m a perfectionist and that has not always served me well. Doing a YouTube less than perfect is a challenge, but I think I’m up for it. I’ve written down the questions you asked in the written blog and will use them, along with the many other videos you have posted (and the AE newsletter) to grow into my next step. lol! If you are able to figure out how to get more hours in a day, definitely pass on the secret! 🙂 But thank you for sharing, Nurit. It’s always very inspiring to hear when someone is inspired to take action! Wonderful, Janine! Take Inspired Action! It’s crucial. 🙂 Thanks for sharing your success!